Today you will arrive in Delhi and be met at the airport by a Mountain Quests representative. We will assist with your transfer to your hotel and offer potential sightseeing advice should you arrive in the city early enough. In the evening the whole trekking team will meet to get to know each other and be given a trip briefing. Today is a long day. We will leave Delhi after breakfast. The journey to Manali will take between 8-12 hours (traffic depending). We will have many stops along the way, for stretching, snacks and meals. When we arrive in the evening we'll check into our hotel and if there is time, wander through the small streets of old Manali and grab some food and drinks for dinner. Today we will take a breather from all the travel, as tomorrow will be another long, albeit stunning, journey. We can relax in the town, do some last minute gear checks and take in the vibe of this awesome hill station town. We will leave Manali early, before breakfast, to start our journey to the trailhead for our expedition. We will drive over the famous Rothang Pass, before dropping into the Lahaul Valley. We will stop for lunch before reaching Batal in the late afternoon. We will set up camp here. Today is when we finally leave all civilization behind. For the next 10 days we won’t see roads, vehicles and maybe not even any other people (aside from our team). 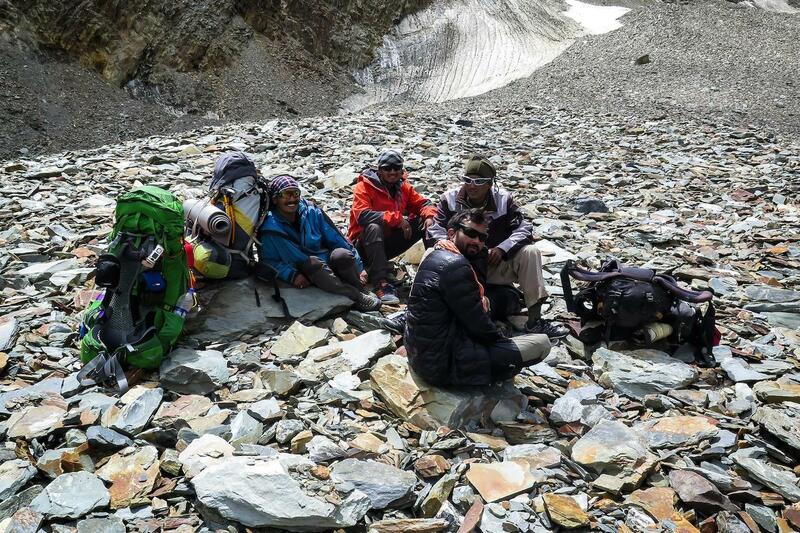 We will start by trekking along the Chenab River, before moving up to our base camp. This is a 6 hour trek that we need to take slowly, as we have already reached 4,500m by road. Our bodies won’t be acclimatized yet and some of us might find today difficult. Our campsite will sit next to a glacial meltwater stream, although if it is warm, it will be more like a river. Tonight we’ll relax and continue our acclimatization. Today will be quite a relaxed day at base camp. After a late breakfast we’ll think about a gentle walk up the Chandrabhaga glacier to continue acclimating to our environment. We won’t go too far though, spending time resting and getting used to the altitude. We’ll be back in base camp for a late lunch and the rest of the day will be spent playing cards, reading or preparing for the days ahead. Today is a lot more of a challenge. It is also very exciting! 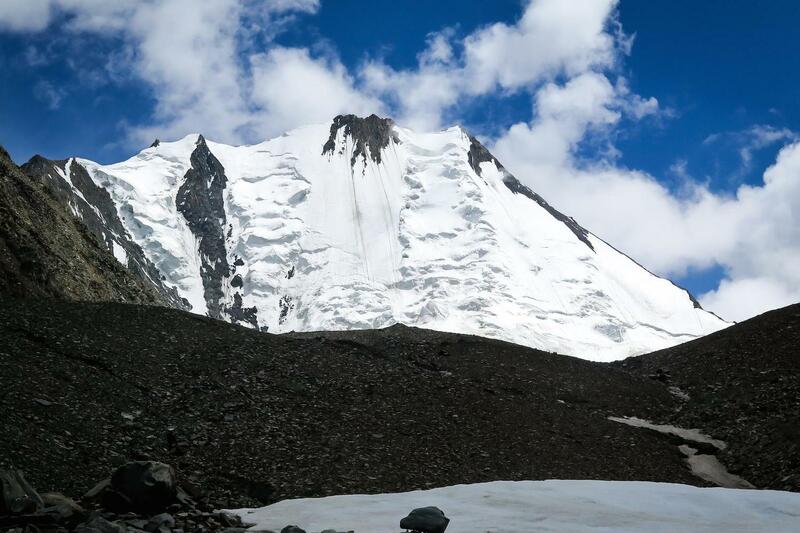 After breakfast we’ll start trekking back up the Chandrabhaga glacier, but this time we’ll go a lot further, before taking a left turn up a steep scree slope to reach advanced base camp. The scree is difficult and really saps our energy, so we’ll take things easy. When we eventually reach ABC we’ll relax, get some lunch and take some time to rehydrate and regain our energy. At ABC CB13 will be right in front of us and, weather permitting, we’ll be able to see the entire climbing route to the summit. It will be hard to not study every part of the mountain while we rest. After lunch we’ll head back to base camp the way we came. 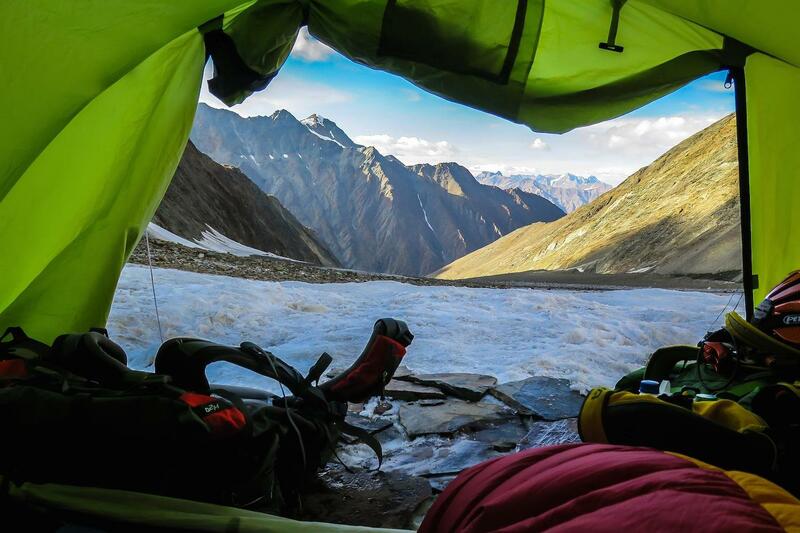 Today we’ll trek all the way back to advanced base camp, but this time we’ll sleep here. The trek will be just as difficult but we can take our time as we won’t be heading back. At ABC conversation will all be about the climb and we’ll spend hours looking at our challenge in front of us. When we reach ABC we’ll settle into our tents, grab lunch and relax. We’ll also have dinner here, giving our bodies time to continue acclimatizing. Today is a chilled out day to allow our bodies time to get used to the altitude. We’ll be at over 5,000m and will need the rest. 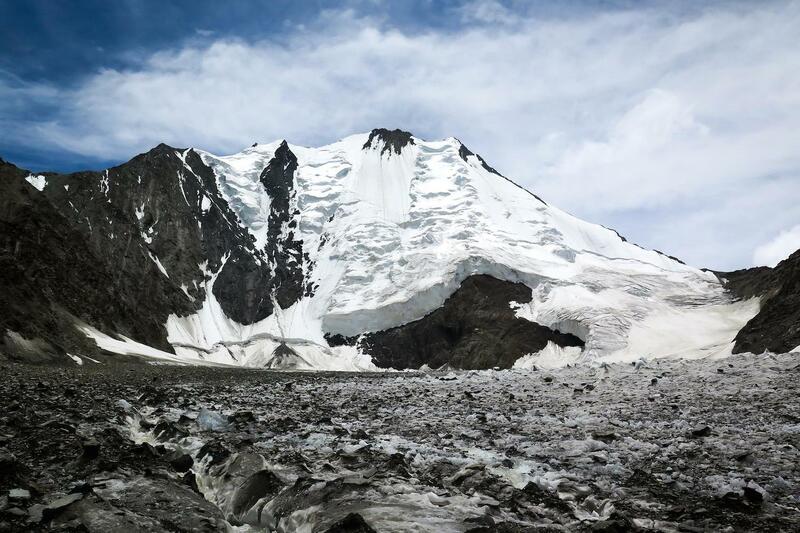 If we feel strong we can walk further up the CB13 glacier to aid our acclimatization, but it’s not mandatory. Today is harder than it looks. We’ll be leaving ABC, taking all our things with us, to reach glacier camp. The route starts a little steep before flattening out along a scree-covered glacier. There may be snow if there was recent snowfall. The journey will take us all the way to the base of CB13, but will take 5 – 7 hours. The route looks flat and easy but it is deceptive. At this altitude it will take time. As we near glacier camp we might come across the wreckage of a 1970s Indian air force plane crash. It’s a sobering sight and will take our minds off the tiring journey for a small period of time. Once we reach glacier camp we’ll be right up against the base of the mountain and will be able to study our climbing route further. The camp is on ice and it will be cold. We’ll definitely be in our cold-weather clothes tonight. 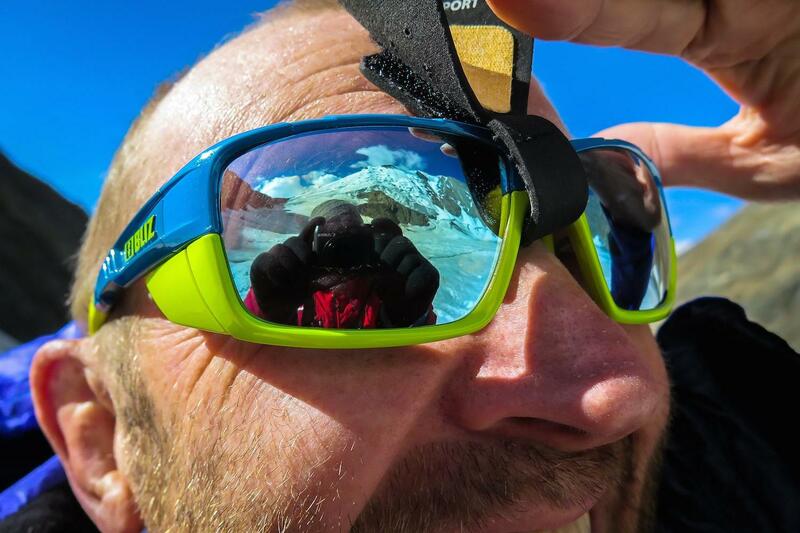 We’re almost ready to climb, and if we all feel strong and acclimatized then we will start today. More likely though, we’ll spend a day at glacier camp, getting our climbing gear ready and gaining strength for the climb ahead. Today is the start of the business end of the trip. We’ll start our climb, heading to camp 1, which is located on the ridgeline of the mountain we have been looking at all these days. It’s not necessarily a long day, but it is tiring and committing. The route will steadily steepen out of glacier camp, until we start some basic ice climbing on ropes, being belayed from above by our guides. 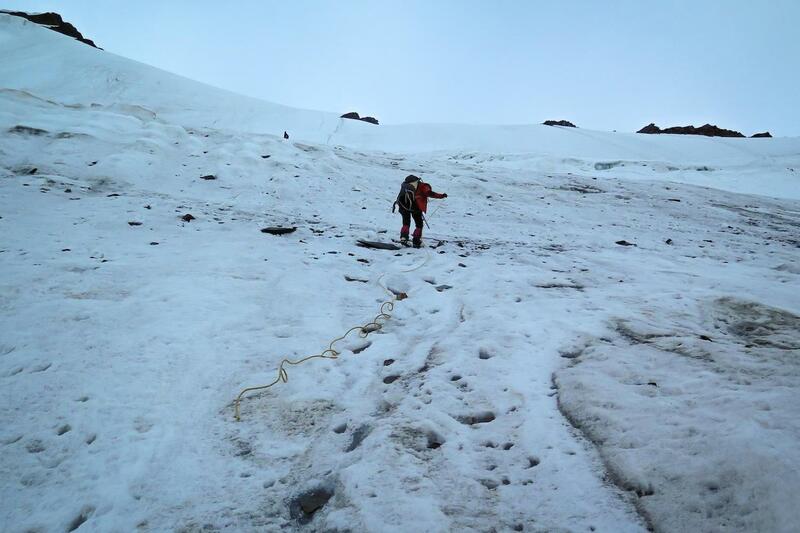 We’ll need to cross a large crevasse at about half way before finishing our climb to the ridge. Once at the ridge we will make camp for the night. If the weather is good we will be able to look up the ridge all the way to the summit. Today we will get up well before sunrise to start our assault on the summit. We’ll leave camp in the dark and start climbing along the ridge. We’ll spend most of our time just below the ridge, to stay on the snowline, occasionally needing to negotiate rock bands along the way. Progress will be slow and steady all the way to the summit. 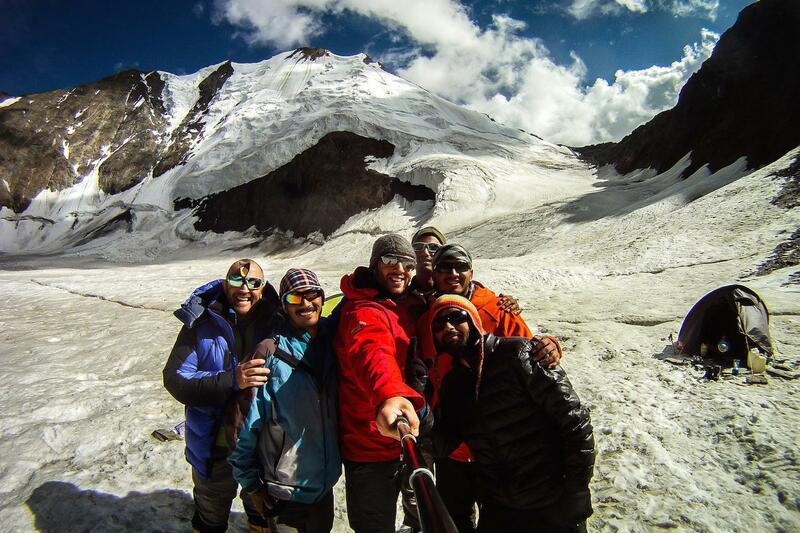 From the summit we’ll get 360 degree views of the mountains in Spiti and Lahaul valleys, as well as Ladakh and Tibet. As long as the weather is good we can spend time savouring our accomplishment before making our way back down the mountain. The route is steep so we’ll need to take care. Below camp one we’ll rappel a few pitches before getting back to Glacier camp. 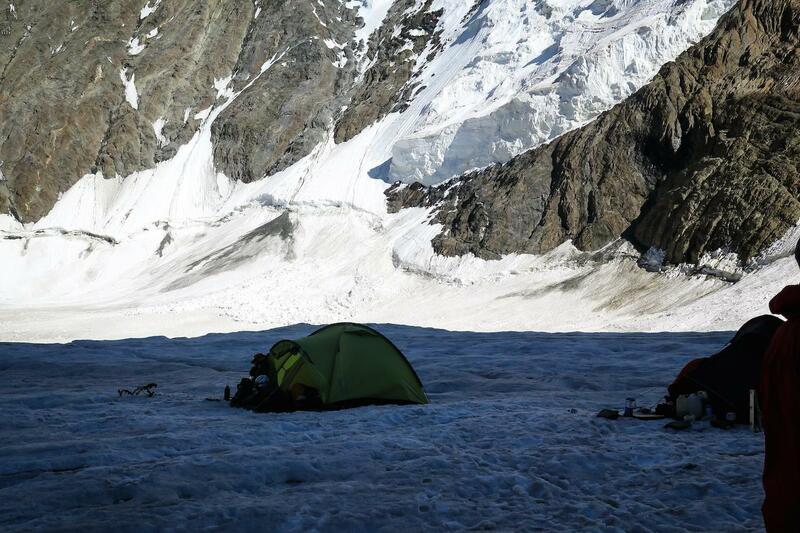 We’ll rest here, take some food and some drinks, before moving back to advanced base camp. Here we’ll finish for the day. We’ll be very tired but we’ll finally have some time to really think about what we achieved today. We’ll sleep very well tonight. 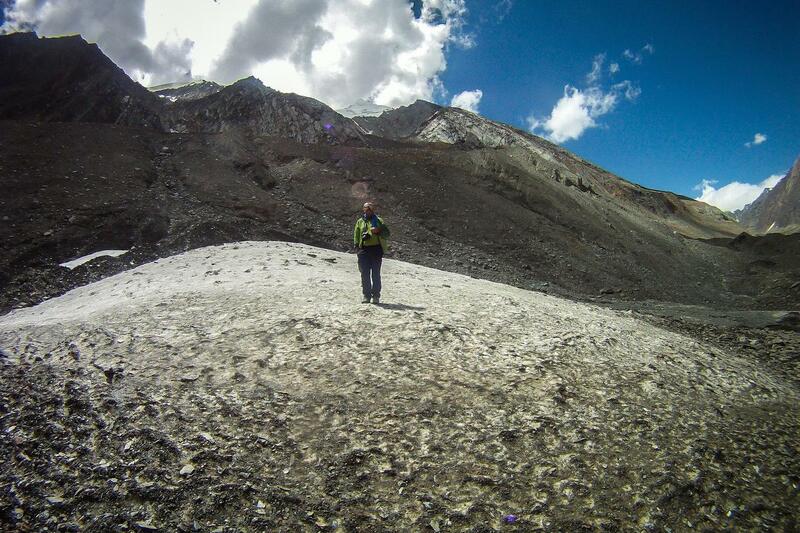 Today we’ll start by heading back the scree slope and onto the Chandrabhaga glacier heading back to base camp. It’s a welcome short day today of only about 4 hours. When we arrive back at base camp we’ll relax and enjoy our last night’s camping on the trip, with the river as our soundtrack. Today we’ll start our trek back to Batal early. After breakfast we’ll start the 4-5 hour trek to the road, where our transport will be waiting for us. We’ll then drive the 5 hour journey back to Manali, where a good hotel with shower awaits us. Tonight we can finally celebrate our trip properly in one of the many restaurants and bars in town. A spare day in case of bad weather on the mountain. Today we’ll be back in our private jeeps to start our 8-12 hour journey back to Delhi where we’ll spend the night. Depending on what time your flight leaves today you might have some time to explore the incredible Capital city of Delhi. Whatever happens we’ll help you get to the airport for your flight home. We’ve loved having you with us and hope that the memories of this journey will live with you forever. If your preferred date is ‘unavailable’, please get in touch using the enquiry form as we can also accommodate custom tours and dates.